In 2007, the same year that Pepin received a diagnosis of bipolar disorder, BMC Health Services Research compiled a list of 250 labels—derisive words such as crazy, bonkers, nuts, and psycho—used to stigmatize individuals with mental health issues. The negative attitudes attached to such labels are far reaching, and frequently generate feelings of fear, distrust, pity, and rejection. For some, joining a support group, which offers a nonjudgmental platform to share and explore similar experiences, is a way to mitigate that stigma. Detail from “Alice Waited For The Game To Start” by Alexandra Petersen. 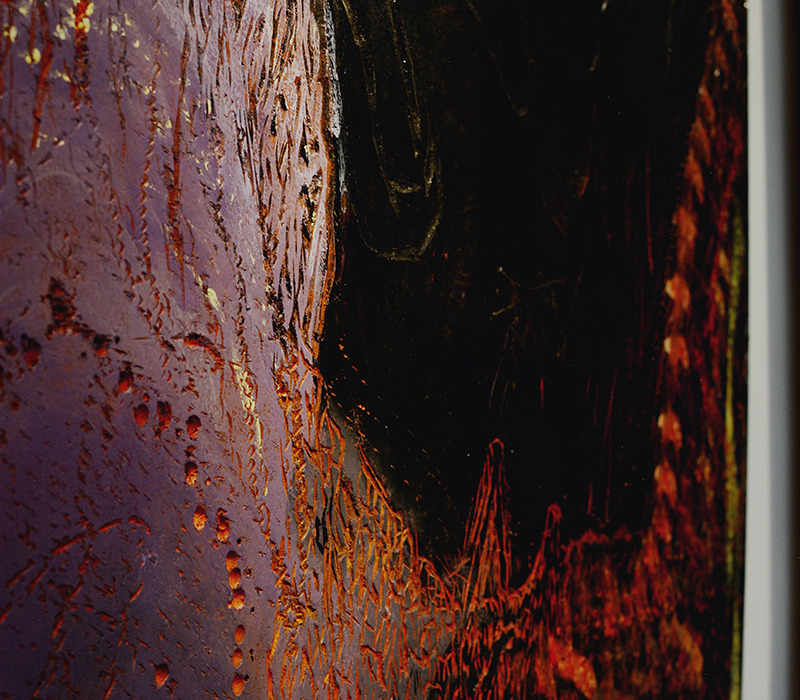 Encaustic over pen & ink drawings on wood base. Photo by Jayna Milan. 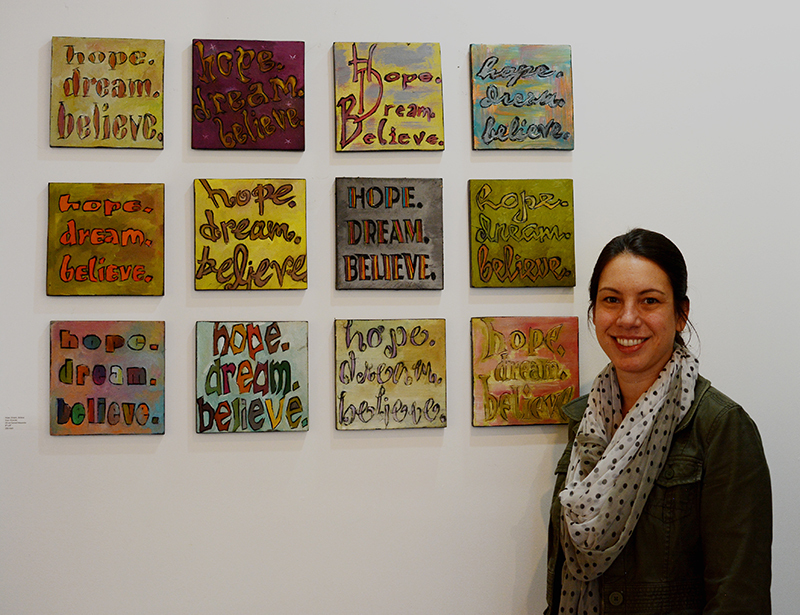 To her surprise, Pepin found that her support group was bursting with artistic talent. Among its members were several painters, a classically trained pianist-turned-composer, a published poet, and a dancer. They were people whose thriving creative practices and psychiatric diagnoses weren’t mutually exclusive. Still, Pepin felt that the stigma of mental health was so powerful, that there had to be plenty of artists who, no matter how accomplished or prolific, were seen as “mentally ill” first, and as an artist second. J. Pepin Gallery. Photo by Jayna Milan. 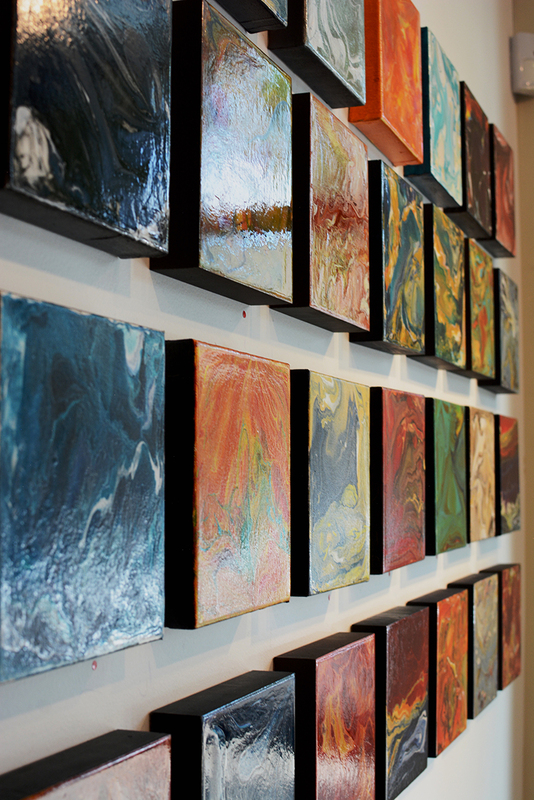 Detail of “Re-lease Tiles” by Jennifer Pepin. Acrylic on Canvas. Photo by Jayna Milan. 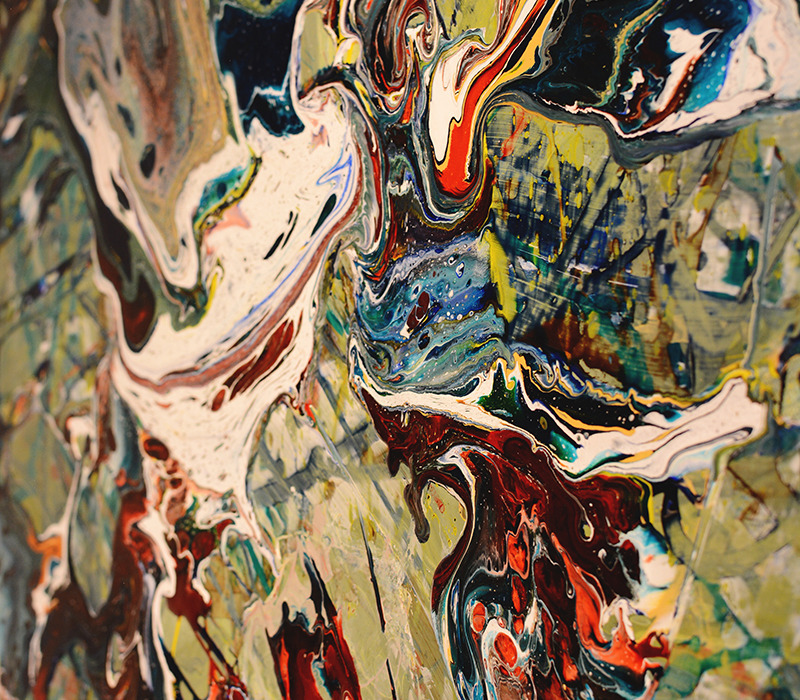 Detail of “Scatter” by Jennifer Pepin. Acrylic on Canvas. Photo by Jayna Milan. Detail of “Emo No. 3” by Evan Orlando. Oil over Carved Masonite. Photo by Jayna Milan. While visiting an online forum on mental health issues, Foster came across a comment thread between three local artists with bipolar disorder. Pepin made contact with the trio to gauge their interest in showing artwork at the now soon-to-be-opened gallery, and she found them to be unanimously enthusiastic at the prospect. When J. Pepin Art Gallery opened last September, its first show included work by Foster and Pepin, along with the three artists they found online. Since then, the 900-square-foot gallery has hosted ten featured artists, with three to four additional artists rounding out each show. Outwardly, the gallery looks like any other polished white cube that makes up the Pearl District’s art hub. There are no brochures for mental health resources among the postcards by the door. No flyers for art therapy groups taped to the widows. Other than a small A-frame sign that quietly heralds the gallery as a space for like-minded artists, there is no mention of Pepin’s mission to bring change to the current paradigm of mental health. It’s only after reading the artists’ wall-mounted statements that the subject finally emerges. Detail from “Three Little Birds” by Alexandra Petersen. Encaustic over pen & ink drawings on wood base. Pepin says it’s a common misperception that if you take a creative individual and add a mental health issue, it somehow equates to something less than fine art. 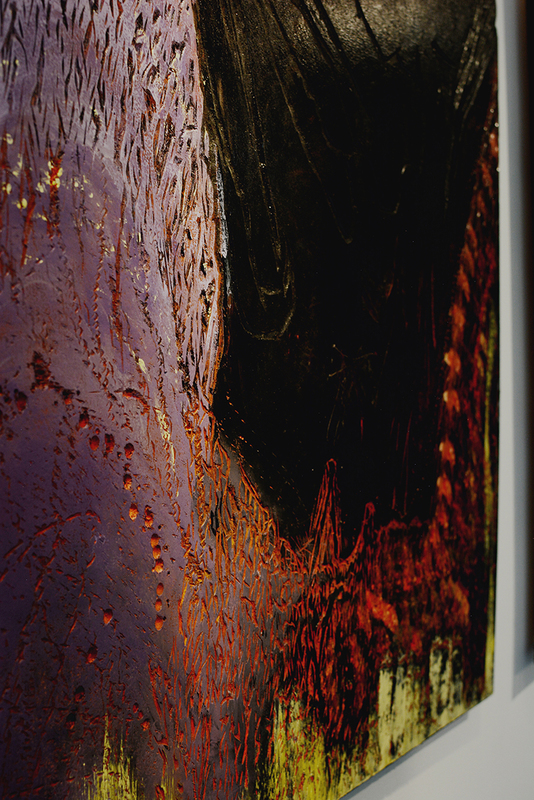 Two of Orlando’s abstract oil paintings, brushed over meticulously carved hardboard, command a portion of the gallery’s south-facing wall. One painting is a blurred rendering of a roller coaster tearing through the night; the other a study of scratches and peeling paint on the side of a dumpster. As dynamic as the paintings are in person, the power of Orlando’s work is diminished on the gallery’s website—their rich surface texture disappearing when photographed from one angle, while at another angle, their discordantly vibrant colors look flat and lifeless. 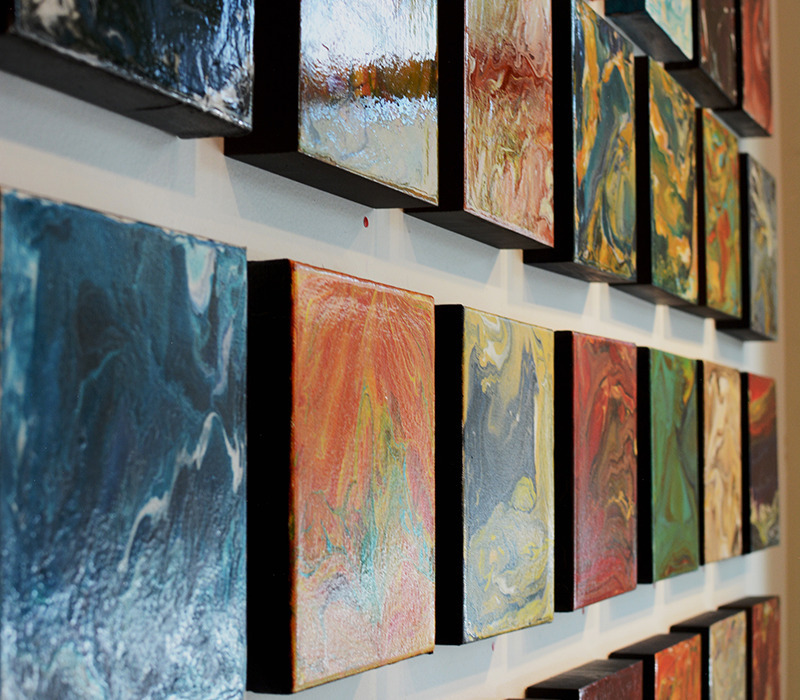 To really appreciate Pepin’s acrylic paintings, which are featured at the front of the gallery for the remainder of the month, they also need to be seen in person. 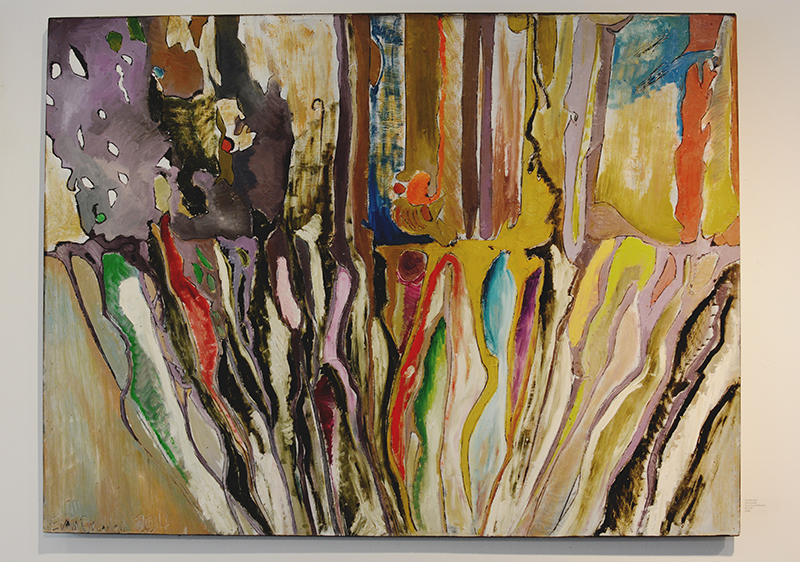 Only recently, Pepin discovered a pouring technique that she says produces “an explosion of color,” while at the same time forces her to relinquish control of each painting’s outcome. The method she uses results in slick and unexpectedly glossy surfaces. The frantic, whorling lines on some mimicking the endless storms on Jupiter; while on others, pastel blobs quietly ooze together like melting ice cream. 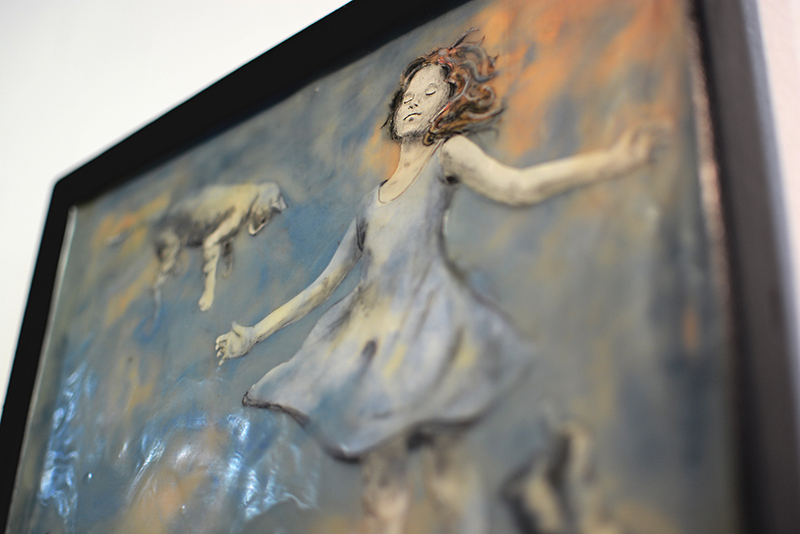 Detail from “I Dream in Blue” by Alexandra Petersen. 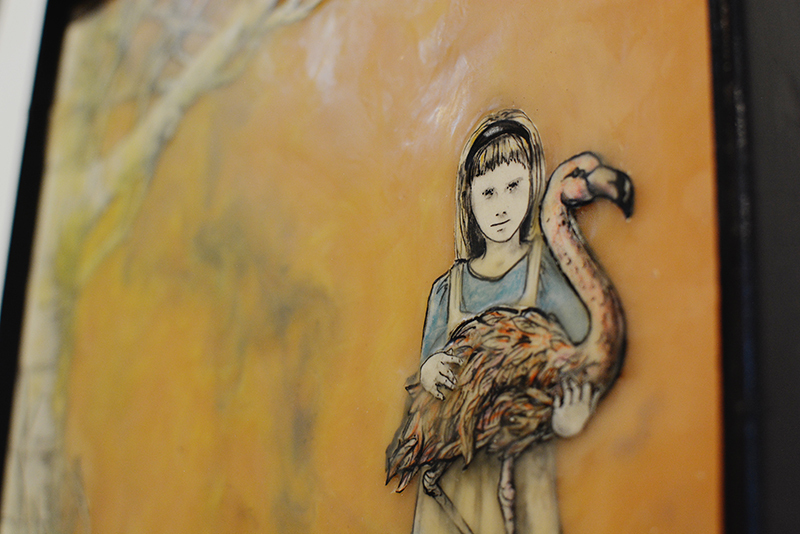 Encaustic over pen & ink drawings on wood base. Photo by Jayna Milan. 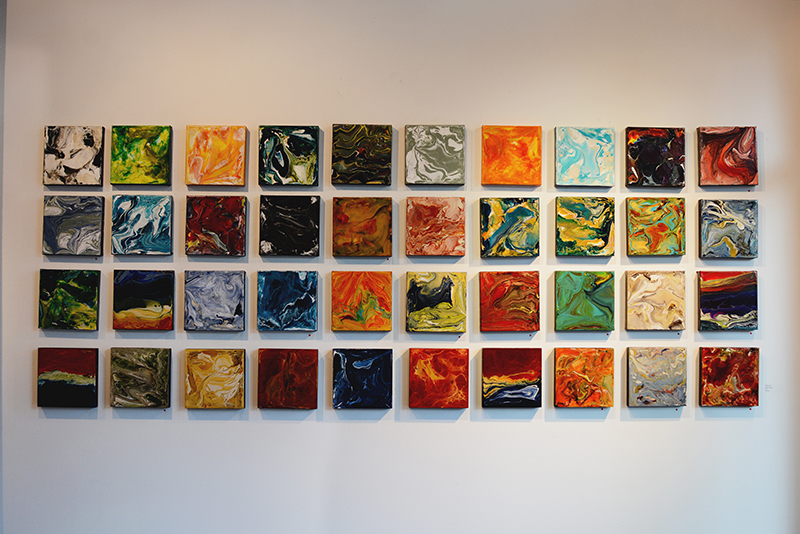 “Re-lease Tiles” by Jennifer Pepin. Acrylic on Canvas. Photo by Jayna Milan. 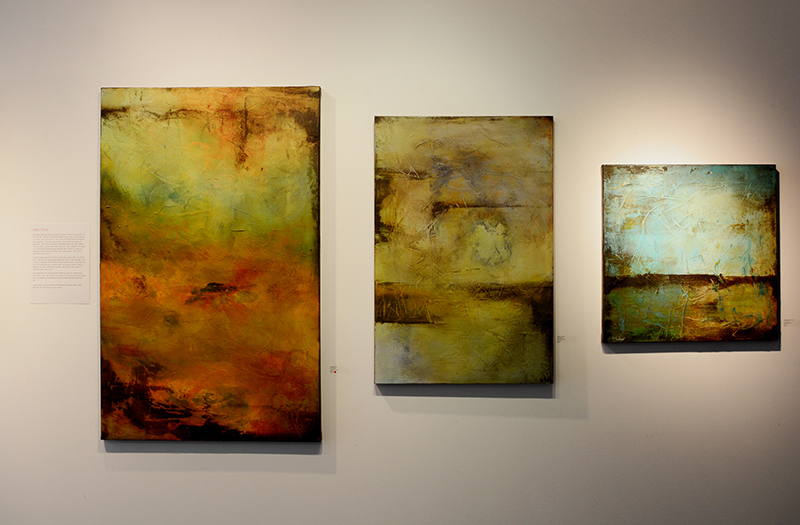 Works by Chris Foster at J Pepin Gallery. Acrylic on canvas. Photo by Jayna Milan. 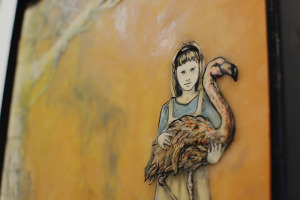 Online images of Alexandra Petersen’s encaustic paintings don’t accurately describe their otherworldly luster, a byproduct of layering translucent, amber-tinted wax over delicate pen and ink drawings. 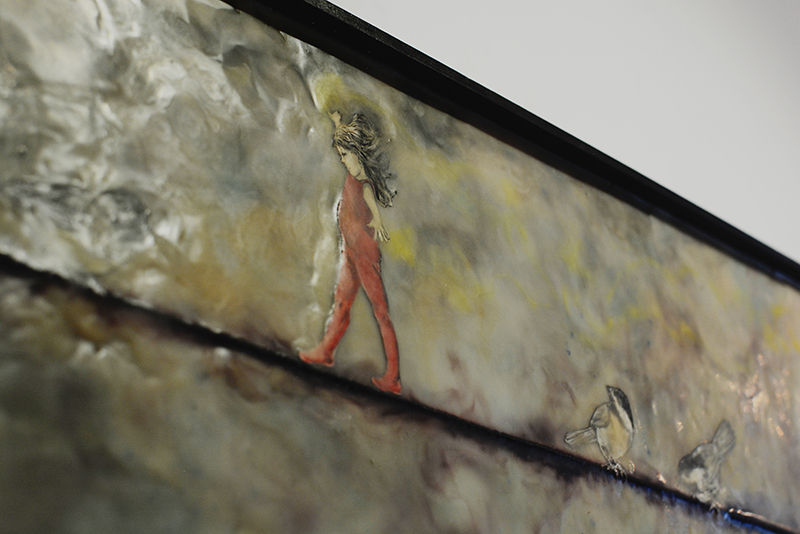 In one painting, an inquisitive finch watches a girl tightrope walk across a telephone line. In another, a melancholy boy grips the strings that tether three floating goldfish above his head like balloons. The dream-like haze of Petersen’s work kindles a nostalgia for childhood, where the magical and the mundane coexisted with ease. There’s certainly a disconnection that takes place between the images of artwork on the gallery’s website (which for the most part are presented as single, straight-on photographs), and the reality of the artwork, which makes it easy to dismiss as superficial, or banal. But to pass such broad judgment without seeing the work in person would be depriving yourself of all the little gouges and scrapes, the jarring colors, the light diffusing layers, the luminous surfaces, the depth and dimension—the details that are so fine they simply can’t be seen in a photograph at all. In other words, you’d be forming an opinion without seeing the whole picture, which is what makes up the crux of stigma itself. J. Pepin Art Gallery presents work by Meghan Caughey, Kyle Evans, Evan Orlando, and Alexandra Peterson, along with Jennifer Pepin’s featured exhibit, Re-Lease through Nov. 2. 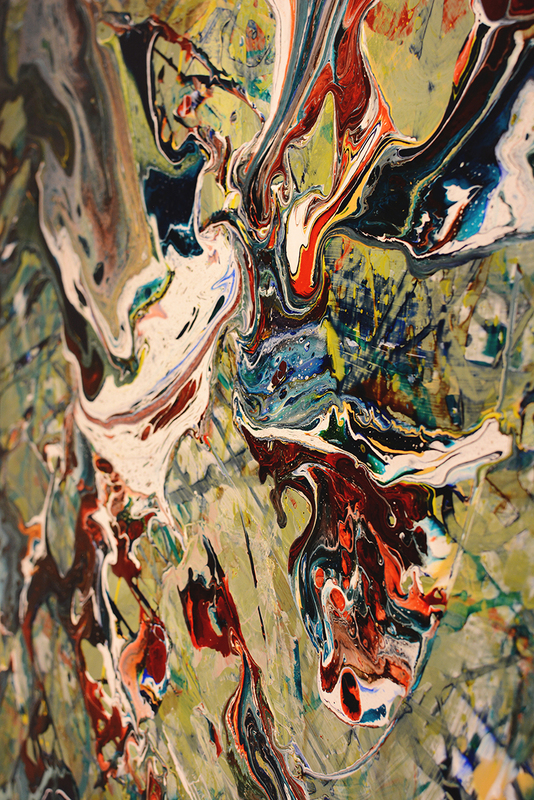 Artist Chris Foster’s new exhibit opens Nov. 4, with a Nov. 6 reception. 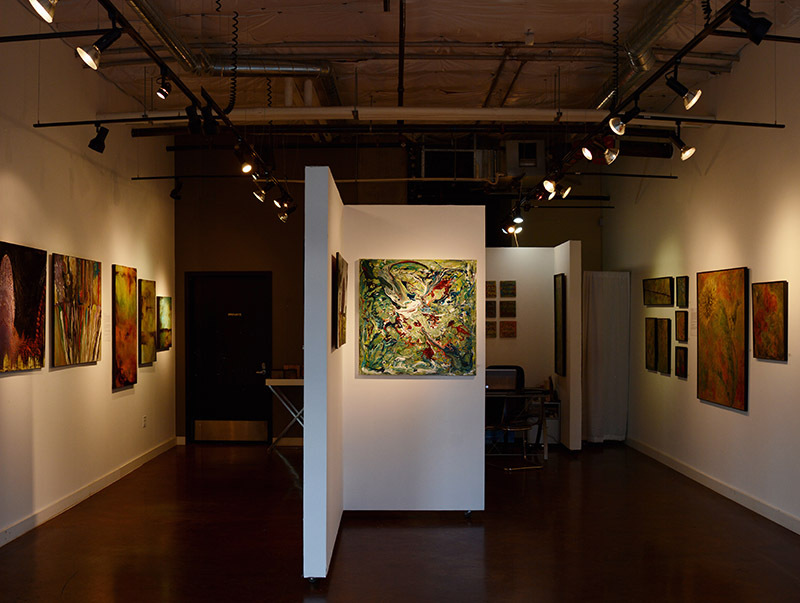 In support of Mental Health Awareness Week, J. Pepin Art Gallery will donate 10 percent of October sales to the National Alliance on Mental Illness (NAMI) Multnomah. The gallery will also raffle off an original painting by Jennifer Pepin, with 100 percent of the proceeds benefiting NAMI. Tickets may be purchased at www.jpepinartgallery.com, or by calling 503-274-9614.